PHOENIX — A group of dedicated residents are fighting to save the Phoenix Chinese Cultural Center from being demolished by using an online campaign. Jennifer Yang, a resident from Gilbert, Arizona, is asking seven state officials to preserve the center after its new owners have been rumored to “strip away all elements of Chinese culture,” the petition reads. “This would destroy an important piece of Arizona’s history. We urge you to preserve our Chinese cultural heritage, Phoenix’s first Chinatown,” it continues. As of Tuesday night, the petition has more than 5,600 of the 7,500 signatures it needs to be sent to Arizona Gov. Doug Ducey, Phoenix Mayor Greg Stanton, Phoenix councilwoman Kate Gallego, state Sens. Kimberly Yee and Katie Hobbs and state Reps. Ken Clark and Lela Alston. Many of the petition’s signers commented on the sense of community the center has brought them over the years. “My family and I buy Chinese food there every weekend, it helped us release homesickness. We are so proud of that specific Chinese culture building here in Phoenix,” read one comment. “We have to preserve their own culture. It always educates the public of Chinese culture and food. This must stay!” read another. The Phoenix Chinese Cultural Center, located near 44th Street and Van Buren Street, was built in the 1990s by the COFCO Group, a state-run enterprise of the People’s Republic of China. The center also host Chinese New Year celebrations and is home to numerous gift shops and restaurants. “True North plans to modernize the center and move 300 employees there. Proponents of the center are pushing the city to declare it a historic center,” the Journal reported. “Special materials and supplies were brought from China, and skilled workers from China spent years making this one of the most beautiful Chinese Cultural Centers in North America,” it continued. Preserving the center will “benefit business and long-term development of the area, and maintain an important piece of Arizona’s history,” the petition argues. The new owner of the Phoenix Chinese Cultural Center plans to strip away all elements of Chinese culture. This would destroy an important piece of Arizona's history. We urge you to preserve our Chinese cultural heritage, Phoenix's first Chinatown. Nearly 200 Chinese-Americans who begged the Phoenix City Council to step in and preserve the Chinese Cultural Center on Tuesday didn't get the "yes" they were hoping for — but they didn't get a "no," either. Instead, the council voted 8-0, with Councilman Daniel Valenzuela absent, to allow residents to commission a survey analyzing the historical significance of the 20-year-old property on 44th Street near Loop 202. The results of the study could help or hinder the case the community has tried to make in favor of a historic-preservation designation for the property after it changed hands in June. True North Companies sparked panic earlier in the summer when its plans to revamp the center — swapping traditional glazed-tile roofs and red posts for a modern business center — emerged. "Hopefully, we can find a win-win situation where we can sit down as a community and also with the developer … to find out if there’s somehow a way to coexist to make sure this treasure isn’t lost forever," Councilman Michael Nowakowski said at Tuesday's policy session. "Hopefully, this is the first step in that direction." It was not immediately clear how long the survey would take or how much it would cost supporters. The decision does not stop True North from proceeding with development plans, however. The Chinese Cultural Center cost tens of millions of dollars to build in 1997. COFCO, a state-owned Chinese company, envisioned it as a tourist attraction that would connect Arizona and China. Community members raised money to support a Chinese garden with pagodas and handmade replicas of Chinese pavilions and monuments. For years, the 165,000-square-foot center hosted festivals, Phoenix Chinese Week and school field trips. It had a dim sum restaurant, a sprawling Asian supermarket and a Chinese medicine shop, among other businesses. Occupancy rates dropped in recent years, a change True North said pointed to the center's decline. Supporters of the center blamed mismanagement. True North said remaining tenants would have the option to remain at the property after its overhaul, which is expected to take about a year. It has offered to maintain the Chinese garden, preserve and relocate sculptures and other architectural elements, and make available extra pallets of roof tiles. For much of the community, those offers fell short. Nearly 16,000 people have signed a petition asking that the center be preserved, with hundreds marching on weekends outside the complex to rally support. The council received a citizens petition to take up the issue, which under the Phoenix City Charter requires a hearing and a formal response. "The craftsmanship used to design and install the roof tiles and wood timber is of ancient origin. These pieces can't be simply deconstructed like some modern-day Legos set," the Chinese United Association of Greater Phoenix said in a statement. "To suggest that the garden can be protected but the rest of the property and/or its Chinese relationship can be removed and relocated elsewhere is like a doctor saying we had to amputate your feet and hands but you are still whole." Nearly 40 members of the Chinese community, as well as a handful of other supporters, requested to speak at Tuesday's policy session. Recent immigrants spoke of visiting the center when they wanted to remember home, and others shared memories of attending educational trips or festivals there. "There is no question that the Chinese Cultural Center has become an iconic landmark that brings recognition to Phoenix’s commitment to diversity," said Paul Gilbert, an attorney representing the Chinese United Association of Greater Phoenix. He said the center is "a place of religious observance" and "a reflection of the Chinese contributions to Phoenix." Elizabeth Yu, who was involved in the center's design and construction, said a business center can be built anywhere, but the Chinese Cultural Center is irreplaceable. "Do we want to let it be taken down?" she asked the council. "We will have regret the rest of our lives." City staff said it would be difficult to make a solid case for a historic-preservation designation. The designation typically is reserved for buildings at least 50 years old, and the new owner is not willing to preserve the entire structure. Jason Rose, who is representing True North on the project, said the company has "clear property rights" and has nonetheless "outlined numerous, positive options" to the Chinese community. True North is willing to donate $100,000 for a new Chinese Cultural Center at Hance Park, he said. Talks between attorneys for both the Chinese community and True North are ongoing, according to representatives. A judge has ordered the property owner of the Chinese Cultural Center in Phoenix to pause its remodeling and keep its main street sign on until next Friday. Members of the Valley’s Asian community are pressuring Phoenix leaders to save the Chinese Cultural Center. At Wednesday’s council meeting, Raymond Tang, president of the Chinese United Association of Greater Phoenix, presented a petition asking councilmembers to take up the issue of preserving the center within 15 days or at its next policy meeting. The Arizona Republic reported a new property owner plans to turn the location near 44th and Van Buren streets into a business center and corporate headquarters. That worries people like Andy Zhang, vice president of the Arizona Asian Alliance and an immigrant from China. Before COFCO, a Chinese state-owned company, opened the center in the late '90s, Zhang said Chinese artisans used traditional materials and techniques in its design. He said they hope to convince the new owner to avoid demolition. Community groups are also trying to get the city’s historic preservation department to designate the property as culturally significant, which might help protect the architecture. The Chinese Cultural Center in Phoenix closed the doors of its iconic market this weekend because of new ownership. But members of the community say they will fight to keep the identity of the building. "The kids love coming here," said Cathy Tuncap. "Sometimes we take a break they go see the, um, fish pond and everything, so they're bummed as well." Tuncap said she will miss having this gem just a short drive away. "I think it has all the diverse culture, background, you can come in and get Chinese food, Filipino food," she said. "I'm from Ohio and we didn't have markets like this in the smaller areas of the city," said John Pisctiello. He said makes the 30-minute drive to the Chinese Cultural Center, near Sky Harbor airport, from Goodyear. "I really like the fact that there's a cultural component to this, it's one of the reasons I like coming here," he said. "It's a very nice place," said Jim Thomas. "The Chinese restaurant here is fantastic, I've been going there for years." Thomas said he's been coming here for 15 years, and says it's unfortunate. "It's business, that's how business works," he said. "For some reason, the developer wants to take off all the markings of the Chinese center, the rooftops, that were made by hand," said former Phoenix Mayor Phil Gordon. He said he was chief of staff to the then-Phoenix mayor when this place was built. "The statues that he wants to move away or donate to whoever wants to take them, that were blessed by Chinese religious leaders that came all of the way from China," Gordon said. He said they want the facade of the building, its adornments, and the garden saved. The developer, who will turn this into office space, has only agreed to keep a small room for community members and maintain the garden. "He has refused to agree to not take off the roof tile and the symbolisms that identify this as the Chinese cultural center on the basis he said he can't rent it that way," Gordon said. Gordon added they're not going to give up on maintaining its identity and they want to go back to the table with the developer. "Hopefully we can do this without either having to designate this a historic monument which would slow down the developer's progress and no one would win, or two go to court, which the community is prepared to do," Gordon said. The city of Phoenix recently denied a citizen petition to preserve the Chinese Cultural Center. Now, people hoping to save the defunct center's architecture and gardens are pursuing historical preservation efforts to legal action. On Tuesday, September 12, the Phoenix City Council agreed to undertake a cultural survey that Chinese Cultural Center advocates hope will help make a case for historic preservation. Later that week, a Chinese-American-owned business still located on the site filed a lawsuit aimed at stopping changes to the center. Located on 44th Street just north of Van Buren Street, the now-defunct Chinese Cultural Center site is set to become the headquarters for True North, a Scottsdale-based private equity firm. One of its subsidiaries, a company called 668 North, purchased the Center's property in June for $10.5 million. That means major changes are coming to the site, which had served as the city's sole Chinese Cultural Center since it was built in 1997 by a real estate firm called BNU Corporation. That's a subsidiary of China National Cereals, Oils and Foodstuffs Corporation (COFCO), a business owned by the Chinese government. center includes 165,000 square feet of building space with Chinese-style architecture, created with the help of several master artisans based in China who obtained special visas to travel to Phoenix and participate in the project. The site also includes extensive gardens, complete with a koi pond and several stone statues of Chinese figures. The degree to which various elements are being preserved by the new owners is unclear at this point. The buildings at the former center's complex have primarily housed retail businesses and offices through the years, including some owned by Chinese-Americans. One main tenant, Super L Ranch Market, left the site when notified by the new owner that its lease had expired, and is getting ready to open at a new location in Scottsdale. Some signage at the one-time Chinese Cultural Center site still retains the COFCO name. Many of the center's other spaces are vacant, but the new owner says remaining tenants can stay until their leases expire. True North subsidiary 668 North purchased the site from New York-based investment firm Angelo Gordon, which acquired the site from COFCO in 2016, according to a True North representative who spoke with New Times on Wednesday, September 13. Members of the metro Phoenix Chinese-American community are concerned the change in ownership will result in wiping the site clean of Chinese design and culture. They've tried different approaches to saving the site, including holding public protests at the former Chinese Cultural Center. On Friday, September 15, protesters gathered outside True North headquarters in Scottsdale. Chandler resident Raymond Tang submitted a petition to the Phoenix City Council during its Wednesday, August 30, meeting. Tang is president of the Chinese United Association of Phoenix. But the City Council voted to deny the petition during a policy session on Tuesday, September 12. Council members stated that private-property rights preclude them from requiring the new owner to preserve the center. Visible changes are already underway, including the removal of some Chinese Cultural Center signage. Last week, the new owners fenced off portions of the property, but explained via press release that it's merely a safety measure "while tenant improvements and other work is undertaken," rather than a prelude to future demolition. No demolition permits were on file with the city of Phoenix as of late afternoon on Friday, September 15. Several members of the Chinese-American community in metro Phoenix want the Chinese Cultural Center, including existing buildings and extensive gardens, preserved. Several elements are replicas of significant Chinese landmarks, says Elizabeth Mann, who helped develop the center while head of BNU Corporation. Advocates for preserving the Chinese Cultural Center say the buildings and gardens have historical and culture significance. Architect Ye Juhua has sent several letters to the Phoenix City Council, explaining the significance of various materials and design elements. Ye designed the Chinese Cultural Center, and helped create a Ming-style garden for the Metropolitan Museum of Art in New York. Dozens of Chinese-Americans spoke in support of preserving the center during last week's Phoenix City Council policy session. Mann talked about the rare materials used to build the center, and the Chinese master artisans who traveled to build it. For example, the center includes a type of stone used for the Forbidden City, an imperial palace built during the 15th century for members of the Ming dynasty. There’s also an online petition, created by Jennifer Yang of Gilbert on Change.org. As of Monday, September 18, it had more than 16,000 signatures from people who want the center preserved. Advocates are holding out hope that the Center might still be saved. Some have retained attorney Paul Gilbert of the Phoenix law firm Beus Gilbert, who says his clients will continue to press for preservation. They’ve offered to fund a survey that would address the Chinese Cultural Center's historic and cultural context. During its recent policy meeting, the council approved the city undertaking such a survey. Advocates hope the results will show that the center should qualify for historic preservation, despite that fact that it’s just 20 years old. Typically, buildings have to be at least 50 years old before they can be considered for historic designation, says Michelle Dodds, historic preservation officer for the City of Phoenix. But buildings can sometimes qualify due to their special significance, she says. Conducting the survey is the first step toward providing the historical and culture context the city would need to evaluate whether the center might qualify using that criteria. The survey will likely take six months, Dodds says. That's before a formal review process could even begin. Even then, the odds aren't good. Only two Phoenix properties less than 50 years old have been given a historic designation. One is the building previously known as the Good Shepherd Home for Girls located near 19th and Northern avenues, which was built around 1942 and placed on the Phoenix Historic Property Register in 1988. The other is Santa Rita Hall, built around 1962 near 10th Street north of Buckeye Road. That made the list in 2007, because of a historic 1972 fast undertaken there by Chicano activist Cesar Chavez. "The criteria are really tough," Dodds says. "To really have control over a property, you have to own it." Essentially, the company 668 North is free to make any changes not prohibited by zoning laws or stipulations in the original site plan for the Chinese Cultural Center. Despite advocate concerns that 668 North could demolish buildings or gardens before that survey is completed, a company representative told New Times in an email on Wednesday, September 13, that they have no plans to do so. "We have already announced preservation of the garden," he wrote. "There will be no demolition of buildings, only remodeling and relocation per previous press releases." "It's so hard to build something," Elizabeth Mann says, "but so easy to destroy it." In a release issued on Tuesday, September 12, 668 North outlined several options for retaining or relocating particular elements of the center. They include preserving a block-long garden along 44th Street for the foreseeable future, and making it available to the public during normal business hours. The release also states that 668 North is willing to preserve and relocate certain elements, such as sculptures and a 30-foot-high welcome gate. They've also offered to provide up to 8,000 square feet of retail space for a nonprofit organization to operate a community cultural center on the site, and donate $100,000 toward the planning or creation of a new Chinese Cultural Center in Hance Park. Neither the city nor other groups have announced plans to build a new Chinese Cultural Center. And advocates, who want the Center to remain intact at its current location, are concerned that moving architectural and design elements could cause irreparable damage. One of many architectural elements for the former Chinese Cultural Center in Phoenix. Some Chinese Cultural Center supporters are turning to the courts, rather than the historical preservation process. On Friday, September 15, attorneys for CJ Design & Construction filed a lawsuit against 668 North, as well as True North CEO David Tedesco and his wife, Gemma Tedesco. CJ Design operates the Szechwan Palace restaurant located at the former Chinese Cultural Center, and its lawyers say the company owns rather than leases its space there. The fight over the Chinese Cultural Center in Phoenix took another twist on Thursday. A group of Buddhists claim they were stopped from performing a religious ceremony on the site of the 20-year-old building. "People are trying to pray that they can save this treasurer this garden for the future generations," said Charles Qian. Qian said he and the other Buddhists made several requests to use the property to celebrate the upcoming Chinese Moon Festival. However, he said the new owners denied their requests, forcing them to pray on a sidewalk next to the property under the watch of police. The owners of the center were not available for an interview, but a spokesman said they were not aware of any requests. Had they known, they likely would have allowed them onto the property, said Jason Rose. Rose also described Thursday's events as a "PR stunt," adding that there was a very good reason for the area was locked up. "It was suggested by the Chinese community because of concerns about theft ... or even vandalism so the property owner has responsibly taken care of the garden," Rose said. This the latest clash between those who want to preserve the cultural center and the new owners, True North, who plan to convert the it into office space. 14. The Best Invaluable Phoenix Chinese Cultural Center! Oct 4th！Action! To a Chinese-American group fighting to preserve a cultural center in Phoenix, it's the history that matters most. "The Chinese people appreciate and understand history like no other civilization on earth," Thomas Simon, spokesman for the Chinese United Association of Phoenix, told China Daily. "History is extremely important to the Chinese community. To us here in America, we have 250 years of history. The Chinese talk about 4,000 to 5,000 years of history." The association is stressing the architectural merit of the Chinese Cultural Center as it opposes any changes made to the building by its new owner. COFCO, the Chinese state-owned company, built the center in 1997, envisioning it as a tourist attraction that would connect Arizona and China. The company sold the property in November 2016 to a New York investment firm, which sold it in June for $10.5 million to 668 North LLC, a real estate unit of True North Cos, a private-equity firm. Chinese community members have offered to buy the building back for $13 million, but a True North spokesman told China Daily on Sept 20 that the building is not for sale. True North is converting the building into new headquarters for 350 employees. It has offered to move some elements of the center to a park in downtown Phoenix, such as the paifang, or welcome gate, and maintain the Chinese garden at the current location. In a Sept 20 press release, Simon emphasized that "relocation is destruction". "The True North Company has incorrectly stated that we could easily move the Chinese Cultural Center to another location. This is a false narrative," Simon said. "Each and every Chinese element used in the building process of the property, including the iconic garden, was designed by the same architect that designed the Ming Garden located at the Metropolitan Museum of New York." Madam Ye, the center's Chinese architect, wrote in a recent letter to the Phoenix City Council: "The main building structure and the garden in the foreground complement and echo each other Removing any one of these elements would result in losing its distinct and noble characteristics." She called the center "a truly unique cultural art piece that showcases cultural and classic Chinese architecture and cultural elements in its entirety." The technique used to construct the pavilions and galleries with each piece interconnected is a UN-designated World Intangible Heritage of Humanity. The center was built by masters of Chinese traditional architecture and craftsmanship as classified by the UN World Heritage Center (UNESCO). The masters' ancestors built the Imperial Palace in Beijing, The Forbidden City. Madam Ye said older materials used in the garden are now exhausted, "given the demand for them domestically". "The stone, steles, statues and monuments in the Garden of Harmony are made with stones from Suzhou's Gold Mountain quarry, and today that mountain is protected, and so taking any stone from there is forbidden." A restaurant in the center, which owns 5 percent of the property, on Wednesday was granted a temporary restraining order through Nov 3 to prevent any work being done on the garden and roof tiles. And the owner of a former supermarket in the center plans to sue True North and its publicist for stating that he filed for bankruptcy and owed back rent, both of which are false, said Simon. "The center represents history to the Chinese Americans here, and they are not going to give up," Simon said. "This is a battle between big business and history and culture," he said. Converting Phoenix’s Chinese Cultural Center into a corporate complex would amount to desecrating a house of worship, according to Chinese-Americans who are alleging religious discrimination by the center's new owners. A group of 10 on Tuesday unsuccessfully asked a federal-court judge to prohibit changes to the center's religious elements, saying their removal would demonstrate "an unthinkable level of disrespect." They also asked to regain access to the center's prayer garden, claiming that by being turned away they'd experienced "blatant" prejudice. The Chinese community for months has challenged True North Cos.' plans to modernize the center, after the firm purchased the property through subsidiary 668 North in June. Offers to save and relocate cultural and religious elements have failed to appease protesters, and tensions escalated when fencing appeared around the center on Sept. 13. "The pain that my clients, that Chinese-Americans, feel toward (being locked out) is very, very real," attorney Jonathan Frutkin said. Different standards for different religions? Frutkin contended his clients would be treated differently if they were members of more prominent religions, such as Christianity or Judaism. "We wouldn't say to church-goers, 'Hey, we're just going to rip out the stained-glass windows and the pews, and we'll just move the cross over there,' " he said. Attorney Cameron Artigue argued that erecting a safety barrier is well within a private-property owner's rights, and because the fence bars access to everyone, no discrimination exists. "That fence … keeps out white people. It keeps out black people, Muslims, Jews," Artigue said. "It's a fence." After Judge Diane Humetewa denied the worshippers' requests, True North spokesman Jason Rose issued a statement saying 668 North was pleased the court "upheld private property rights and allowed the revitalization of the site of the former Chinese Cultural Center to move forward." A separate order issued in Maricopa County Superior Court protects the center's traditional glazed-tile roofing and garden statues from demolition until Nov. 3. The Chinese-Americans who use the center and garden for religious purposes primarily practice Taoism, Buddhism and Confucianism. Taoism promotes harmony with nature, spiritual immortality and balance. Buddhism focuses on developing inner peace, kindness and wisdom. Confucianism emphasizes relationship hierarchies, rituals and connections with ancestors. Worshippers of all three religions said the prayer garden — which True North is considering reopening to the public following renovations — has provided them space to meditate, reflect and make religious offerings over the past two decades. Though religious elements are located throughout the property, the garden and its pond are particularly rich with symbolism, they said. The pond's koi fish, for instance, represent strength, ambition, perseverance and good fortune. A statue of the Guan Yin Buddha signifies compassion and mercy, and the lotus flowers surrounding the statue symbolize purity. Elsewhere, builders mounted dragon, tiger, phoenix and turtle statues intended to protect and guard the property. The center also features a replica of the Confucius Temple of Nanjing, a Chinese holy site, and an "ancestors wall." Religion marked the center's construction from start to finish, according to officials involved in its design. A feng shui master provided blessings for peace and harmony. Craftsmen could not eat meat, followed a strict bathing schedule, and prayed each day they worked on the site. For years, the Chinese community celebrated Chinese New Year at the center, as well as the Duanwu, or Dragon Boat, Festival. Worshippers hoped property owners would open the fence in time for Wednesday's Harvest Moon Festival, which resembles Thanksgiving in its themes. Last month, about 20 members of the Chinese community tied yellow ribbons to the construction fence to honor Confucius' birthday. In addition to holidays, Chinese-Americans have used the center for weddings and engagements, they said. "The Chinese Cultural Center is full of the elements of the religious beliefs that have been deeply rooted in my blood since I was born," said Jinhui Chen, who began visiting the center after moving to Arizona in 2010. "I fight for the religious rights, not only for my religious believing, but also for all the community members who hold the same beliefs," he said. PHOENIX (AP) — A judge has ruled that a temporary restraining order will remain in place prohibiting a construction company from making any changes to the exterior of the Chinese Cultural Center in Phoenix. A judge has ruled that a temporary restraining order will remain in place prohibiting a construction company from making any changes to the exterior of the Chinese Cultural Center in Phoenix. That includes any renovations to the center's Garden of Harmony and the iconic tile roof. True North Companies has been seeking to renovate 98 of the 103 condominium units it owns on the site of the cultural center. Community members and Arizona Foundation for Chinese Religious Rights filed a lawsuit against True North and the city of Phoenix. They claim religious rights and other laws were violated due to the planned changes at the cultural center. On Wednesday, a judge extended the temporary restraining order through Nov. 3, which is the next court date. Congrats to Miki and Jacob on their engagement! Thank you for allowing me to capture your engagement photos on Kodak Portra 400 film. I love these photos because the film makes it look like an 80s kung fu movie or something lol. Anyways, enjoy. Chinese civilization and culture spans over 5,000 years. Now we can experience Chinese culture here in the Valley by visiting the Gardens at the COFCO Chinese Cultural Center. The Gardens feature replicas of landmarks from five ancient Chinese cities. Visitors can walk in the harmonious atmosphere of the Chinese gardens that emperors once treasured. Designed by the famous garden architect, Madame Ye, The Gardens carefully adhere to Feng Shui and Ying Yang principles. The architecture within the Gardens displays the careful craftsmanship of thousands of years of training that only Chinese artisans can produce. Consider the discussion taking place over the Chinese Cultural Center near Sky Harbor Airport. In 2016 the original developer of the site, an arm of the Chinese government, sold the property to an American real-estate company. It did so without mandating stipulations that it retain its distinctive Chinese architectural elements. That company then sold it this year to a local company seeking to relocate its corporate headquarters and hundreds of employees from Scottsdale to Phoenix. It has pledged to retain the Chinese garden along 44th Street and preserve other statues and elements for relocation to other parts of the city or Valley. Such on- and off-site preservation is far more than what happened to the Cine Capri at 24th Street and Camelback Road. Or the redeveloper of the Rawhide, Greasewood Flat and Pinnacle Peak Patio sites did in Scottsdale. But that’s not been enough for some in the Chinese-American community. We don’t mean that as criticism. Indeed, we’re agnostic about the property’s aesthetics. But architectural preference cannot trump private property rights, no matter how vociferous the objection by objectors at Phoenix City Council meetings. It is at times like these that principle, not politics, must carry the day. It is not appropriate nor a beatitude for a bureaucrat, judge or rabble-rouser to slow walk these rights. For such action would only encourage it to happen again, but next time to your business, your property or your home if someone simply doesn’t like what you are doing. In the case of the Chinese Cultural Center, the option should be very clear to everyone. If you want someone’s property rights, pay for them. If the owner doesn’t want to sell, that’s their right. If the owner is willing to listen to offers, as is apparently the case here, come up with the money to purchase the property. If you can’t, be aware that the 65 percent of Arizonans who passed Prop. 207 are watching closely to see if the City of Phoenix shows fidelity to one of Arizona’s most critical laws. At least one sign in front of the historical site signifying the cultural center had been plastered and painted over, leaving only the physical address. Members of the Chinese and Asian-American communities say the removal of the cultural center's name from the sign was the result of a recent change in ownership. 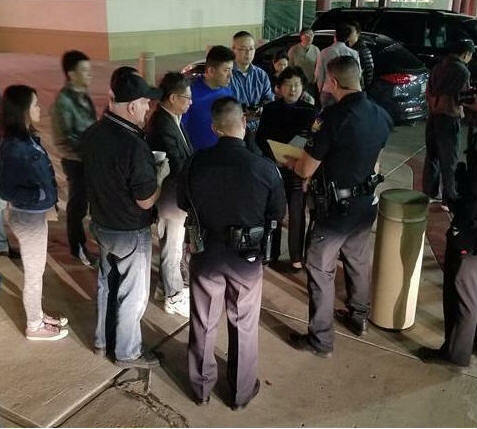 Tenants at the center and members of the Chinese-American community have been attempting to negotiate with the new owner of the property, True North Companies, since the Scottsdale-based company purchased the property in June, according to Thomas Simon, a consultant for the Chinese United Association of Greater Phoenix. "They won't return calls, but have time in the middle of the night to sneak out and cover up the cultural name on the front of the building," Simon said. "It just says volumes. It just says 'shove it.' That's how [the community is] taking it." True North Companies Chief Executive Officer David Tedesco did not return a call from Phoenix New Times. "The Chinese people are very respectful, and they're taking this as a sign of disrespect," Simon said. Garry Ong, a spokesman for the coalition formed to save the Chinese Cultural Center, held a press conference at the restaurant Szechwan Palace in the center to discuss the disheartening move to mar their signs. Ong announced that the cultural center's new owner agreed to meet with Phoenix Mayor Greg Stanton. He said he's hopeful the mayor will convince the new owner to leave the rest of the cultural center unscathed. "There's so much culture and history there, and we don’t want to lose it," Ong said. "We want to sit down and see how we can make this work for both of us." Don’t let the City of Phoenix become the first US city to demolish their Chinatown! Please join our demonstration at 4:40pm on Sunday, August 20th to save Phoenix Chinese Cultural Center from demolition! We are gaining momentum! Our last peaceful demonstration on Sunday has been covered extensively by all major local TV news and newspapers. Phoenix City Councilman Michael Nowakowski joined our last demonstration. We have gathered more than 5,000 signatures, and we have presented our case to Mayor Greg Stanton. Mayor Stanton shares our view that Phoenix Chinese Cultural Center is of great historic and cultural value, and it should be preserved. The Chinese Cultural Center, located on 44th St in Phoenix, was built 20 years ago, It was designed by an architect from China, built by Chinese artisans using traditional techniques, with special materials and supplies shipped here from China. Over the years, it has become a major landmark and attraction where non-Chinese could acquire a sense of what Chinese culture can mean in terms of architecture and aesthetics. It is also a place where Chinese Americans can feel a heartwarming connection to their roots. It has become part of Arizona’s history and cultural heritage. The cultural center is not just for the Chinese community, it’s for all Arizonans. It’s not just for our generation, it’s also for our children, and theirs. It is a cultural icon in our state, and is enjoyed by people of all ages and ethnic backgrounds. We believe we are acting in the best interest of the community as a whole, and that the preservation of the cultural center pays off in the long run. We will be holding our second demonstration this Sunday, August 20th at 4:40pm at the Cultural Center, which is located at 668 N 44th St, Phoenix, Arizona 85008. Please share this with your friends and family, and join us to save this Arizona Chinese Cultural Center! There is ample parking in the parking lot, as well as in the underground garages onsite. We are here because we believe in ourselves and because we love our Chinese Cultural Center. It represents our ancestors and the way they lived. About 2,500 years ago, a philosopher named Laozi founded the religion of Tao. He influenced us so deeply that even Confucius tipped his hat to him. A great believer in non-violence, Laozi’s teachings are very similar to what Christians believe today. So, True North, don’t mistake our humbleness as weakness! The first time I heard that the Chinese Cultural Center had been bought, I did some research to find out if it was true. At first, I just thought that my favorite store, the Ranch Market, was moving. I had no idea that True North had bought the entire property. How did that happen? I thought we Chinese owned it. Now we know. The sad part is that the new owner doesn’t appreciate or respect Chinese culture. They deliberately want to destroy the center. I’ll be handing out important information about zoning stipulation #11. I hope this will help you understand how it applies to this situation. The Chinese people of Phoenix worked very hard to meet the public art requirement of this stipulation. The Chinese Cultural Center has continued over the past 20 years to make these significant art pieces, gardens, and community square open to the public. This isn’t an empty lot or a warehouse that needs to be built or repaired. True North bought a piece of Chinese history and culture and now they want to destroy it. Why? I have been to many Chinatowns in the United States, including Los Angeles, San Francisco, New York, Chicago, and Washington, D.C. None of them can compete with the history and beauty of our Phoenix Chinese Cultural Center. Phoenix is a multi-cultural city and I heard that the city is planning to build a Latino Cultural Center. Listen up, Latinos. You had better cross all the T’s and dot all the I’s and carefully look into all the documents. I would hate for you to have the legal problems in 10 or 20 years that we do now. Not too long ago, some of our people demonstrated at a Pump-Up event. True North’s reaction was to jack the price up on the Cultural Center. On September 13, they removed the stone lions in front of the Ranch Market. We don’t know if these statues were damaged, but they are priceless. Furthermore, if True North damages the rooftop when they remove it, why should we want to buy it? This is not over. It’s just the beginning.